Each year, sometime in the fall (no, it is not yet winter though it may look and feel like it) I take out a little time to page through some old cookbooks stacked on my kitchen bookshelf. Not looking for anything in particular, except some inspiration maybe, on what I might prepare for a couple of varied gatherings over the upcoming holiday season. Does a certain food photo, or even the idea of a particular type of recipe ever intrigue you? 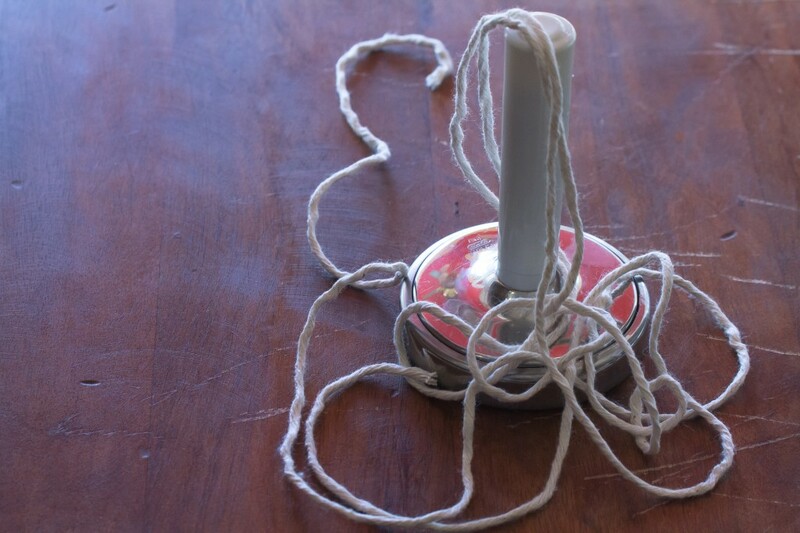 I mean you may look at the same photo or concept again and again, perhaps something once torn out of a magazine, then revisited, maybe saved for years, always filed away for a later time. This sort of fascination has always occurred to me when thumbing through those heavy, large sized glossy European reference cookbooks whose pages include a culinary history, a taste of some top cultural recipes from each country, then providing more specific focus toward some specialty dishes and products among regions. One genre popular in the culinary history among many of these European countries includes roasted stuffed meats, typically pork or beef, stuffed with another meat, such as any variety of sausages. Admittedly, I love stuffed meats, poultry, even some types of fish, from chicken pinwheels, stuffed pork chops, to a beef tenderloin. Once sliced, colorful rounds expose centers filled with perhaps some roasted red peppers, assorted cheeses, mushrooms, spinach, breading, any of these ingredients whose final presentation provides in all what seems quite lovely for entertaining. But what about a center spread with a type of sausage, perhaps a seasoned Bratwurst, or some other ground sausage style meat? This year, with a small pork roast in my basket (well, two) and some choice local sausage selections for sale at the market I decided to give it a go and satisfy my countless fall seasons of curiosity on the sausage stuffed roasts numerously displayed in the glossy European reference cookbooks of culinary history and cultural regional specialties. Choosing an apple smoked bratwurst, I thought this would complement well with a crisp apple or two on hand from our annual apple picking day out at the Frecon Farms Orchard combined with a lightly sauteed mixture of leftover cubes from a stale baguette. It’s not so difficult to simply remove the translucent outer casings exposing the ground seasoned sausage meat, evenly spreading it across the circumference of the roast, leaving about an eighth inch all around the edges, although this small border, in my case, provided a bit of strung up bulging stuffed roasts which may likely be incorrect in any European tradition, or then, maybe not. But, you can easily push in any overflow, and once cooked and sat tented for a bit, the sausage with its meat and other suited contents, sliced with a sharp serrated knife will provide a solidified, colorful, and most importantly, flavorful grand display. 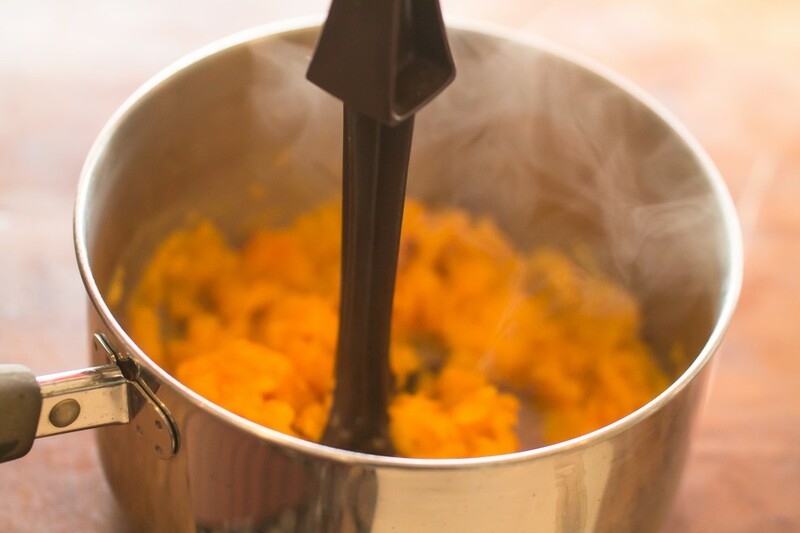 Served alongside a buttery mash of seasoned boiled butternut squash and potatoes this late fall dish provided no sliced leftovers. 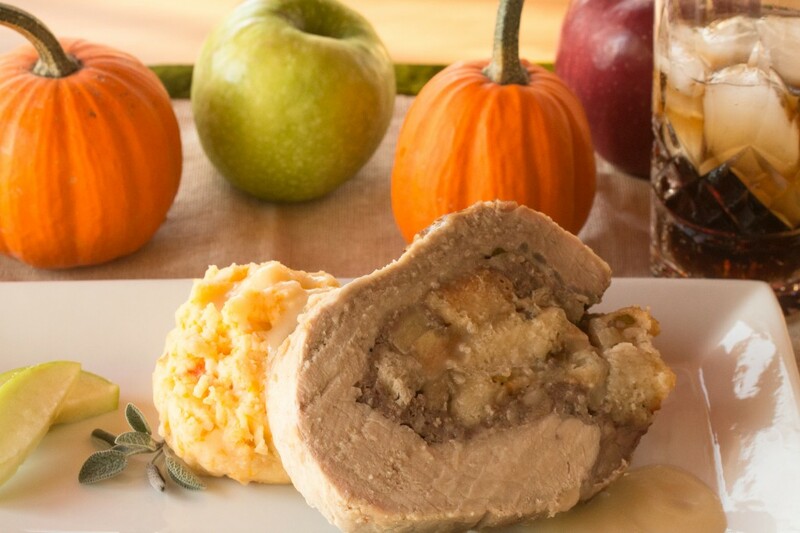 A delightful outcome to a longtime fascination of a roast stuffed with a seasoned sausage meat, now emerged, years later, from its glossy style images, Bratwurst, Apple, Stuffed Pork Roast. Preheat oven to 350 degrees. In a small bowl mix together a half teaspoon each of kosher salt, pepper, garlic powder, and dried sage. Place the Pork Loin Rib End Roast onto a large cutting board. 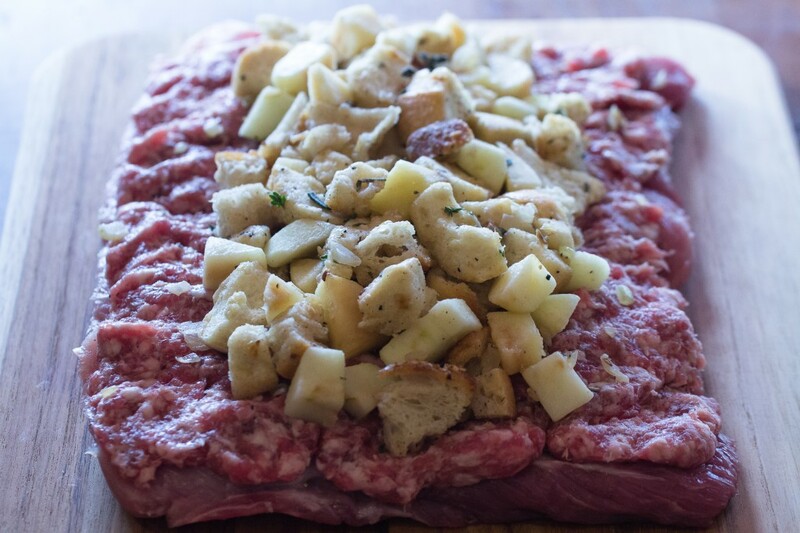 Using a sharp knife, cut the center of the roast working straight across to open the meat forming a flattened rectangle ending the cut about one inch from the end. Once the roast is open and lying flat, use a meat pounder to thin the meat somewhat so it will fit the stuffing better upon rolling up. Rub the spice mixture onto the inside of the pork then evenly spread the bratwurst sausage on top leaving about an eighth inch all around the edges. Cook the quartered two bacon pieces in a pan large enough to accommodate the pork roast, add in 2 tablespoons butter as the bacon begins to render fat. Scrape the chopped onion into the pan, cook on very low heat for two minutes, tumble in the stale bread cubes, stir, sprinkle over a couple pinches of salt and pepper, continuing to cook until the outer part of the bread cubes begin to soften, topple in the apple chunks, stir, cook a few more minutes, sprinkle in fresh thyme and sage. Pour three tablespoons apple cider into the stuffing mixture, stir, heat through, check seasoning, adjusting if needed, turn off heat. Transfer stuffing to a bowl and wipe out pan. Cool stuffing at least ten minutes then carefully spread the stuffing over the bratwurst sausage. 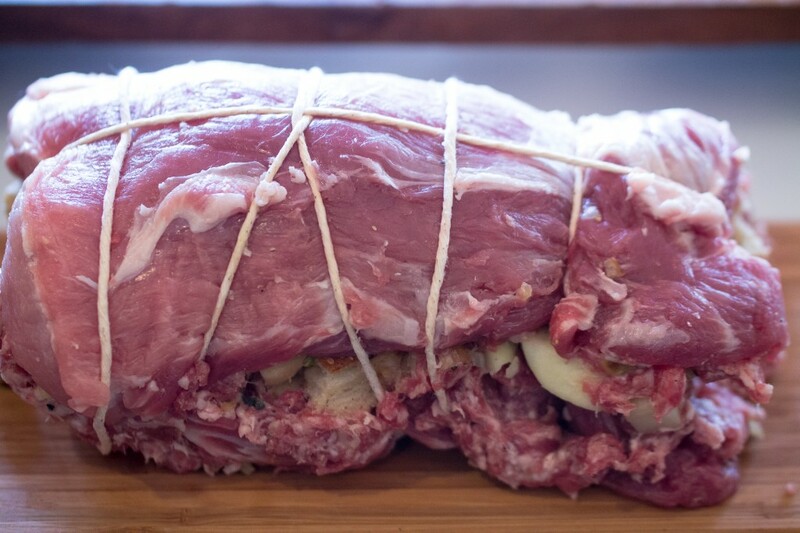 Roll up the pork roast like a jelly roll then secure tightly all around using kitchen string. Any stuffing or sausage that comes out during rolling may be stuck back in. In the same pan, cook the other two pieces of cut bacon adding in the butter as the bacon begins rendering its fat. Place the tied, stuffed pork into the pan and brown roast all around. Once browned, pour chicken stock and apple cider into the pan, cover with aluminum foil and cook for approximately one hour until just done. Remove stuffed pork from oven and place on a cutting board tented for ten to twelve minutes then slice using a sharp serrated knife. Stir Wondra quick flour into a quarter cup of apple cider and cook on medium heat until boiling, pour into the juices remaining in the roasting pan, scraping any accumulated bits of meat, cooking on medium heat approximately five minutes or until thickened. Strain gravy, add in salt and pepper, check seasoning and adjust to taste. 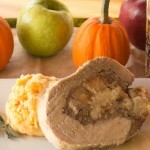 This entry was posted in Meats and tagged Apple Stuffed Pork, Bratwurst, Bratwurst Apple Stuffed Pork, Pork. Bookmark the permalink. Post a comment or leave a trackback: Trackback URL. Dear Peggy, what a wonderful recipe for late fall – we seem to crave these wonderful, comfort-style homecooked dishes when the weather turns colder – no surprise hat there were no next day leftovers, although I can imagine that thin slices of this lovely stuffed roast would be perfect the next day on some crusty sourdough bread slices – maybe even with a bit of mustard! Hello Dear Andrea, Thank you and yes, I thought this recipe was quite a nice comfort- style homecooked dish. Since I derived it’s inspiration paging through a few European Culinary cookbooks, I was indeed thinking of you since Germany is one of these countries displaying this style of roast. And really it would be quite nice for a picnic style lunch too with some sourdough bread and a bit of mustard. 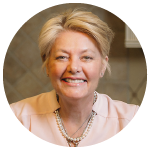 Thanks for joining in and I am looking forward to reading your upcoming holiday season adventures on The Kitchen Lioness. Thanks again and Big Hugs to you! Perfect meal on a cold winter day! I love a good bratwurst and since we live near a German place I might head over there for a brat on a roll right now! Phil recently posted…New Year’s Resolutions, Frozen, Squirrels & Hangovers in NYC! Hi Phil, I love bratwurst too, and think it is totally awesome on the grill on a crusty roll in the summer! 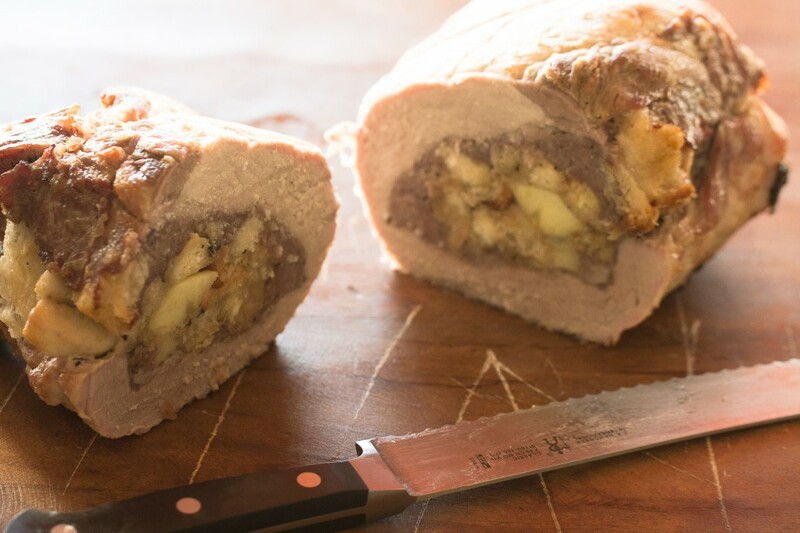 This is an interesting twist removing the sausage from the casing, stuffing it into a meat, and was particularly popular in a number of European countries, including Germany, but not limited to, in observing some of the reference recipes of such cuisines. I’m happy I finally gave it a try. May prepare a similar version in the summer for a picnic lunch! Thanks for joining in!